1. Angkor Wat was built in the early twelfth century–exactly when the French pioneered Gothic architecture in the Basilica of St. Denis. Europeans constructed towering naves and choirs surrounded by stained glass that filled them with light. Khmers couldn’t fashion arches to span large volumes, so the stone rooms they built were narrow and dark. But they made up for it by going horizontal–Angkor Wat’s total area is almost a square mile. It’s filled with sculpture and forms that mix Indian and native symbolism. 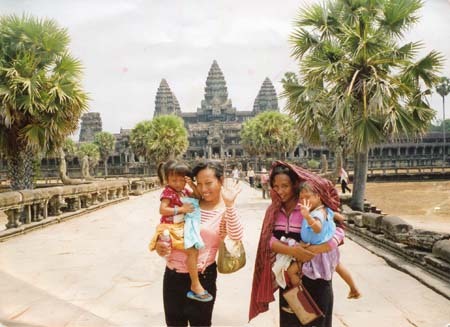 Gothic style and Angkor Wat represent two great cultures’ ways of seeing the world. 2. Angkor Wat is the largest temple in Southeast Asia. 3. Angkor Wat is a microcosm of the Hindu universe. The central tower embodies Mt. Meru, which was the home of the gods at the center of the world. 4. The temple’s builder, King Suryavarman II, dedicated it to Vishnu. Most Kings had worshiped Shiva, so Angkor Wat’s builder was bucking tradition. 5. Most Khmer monuments face East, but Angkor Wat looks West–the direction often associated with Vishnu. 6. Vishnu was the sustainer of the universe, and Suryavarman might have cultivated a mystique about their souls merging. Angkor Wat was probably a trophy home with the king and Vishnu as joint owners–or the sole owner under two names? I don’t’ know how a modern real estate firm would classify this scheme, but Khmer kings could do what they wanted–they didn’t have to answer to a parliament or an independent church. 7. But Suryavarman died before the temple was finished. 8. Angkor Wat didn’t do the king’s subjects much good either. Suryavarman waged wars with powerful neighbors in South Vietnam called the Chams. They invaded the empire and its chronicles say that they sacked Angkor. 9. A violent succession crisis then followed Suryavarman’s death. Some scholars now doubt the sacking of Angkor, but contempories did write that miseries descended on the land. 10. Angkor Wat is now a Buddhist temple. 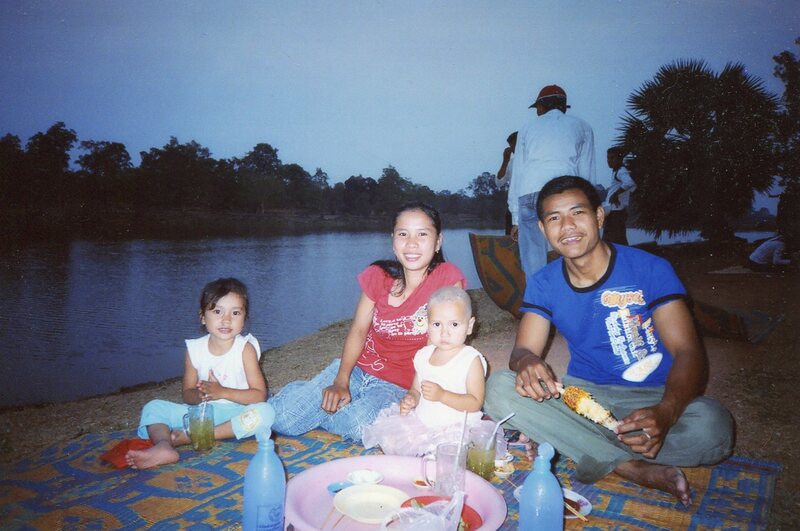 You can mingle with gentle Cambodian families worshipping there. The locals are as dignified as the temple is. Many had spread mats along the outer moat and were eating dinner when I was there, and one man invited me to join his family. 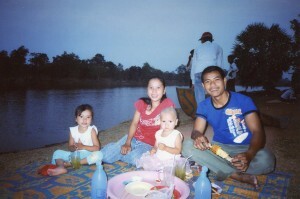 Angkor was full of waterways in its heyday, and the Khmers conducted many festivals by the water. Please venture into Angkor Wat, Part Two–we’ll dare to walk to Angkor Wat’s center and see its inner mysteries.